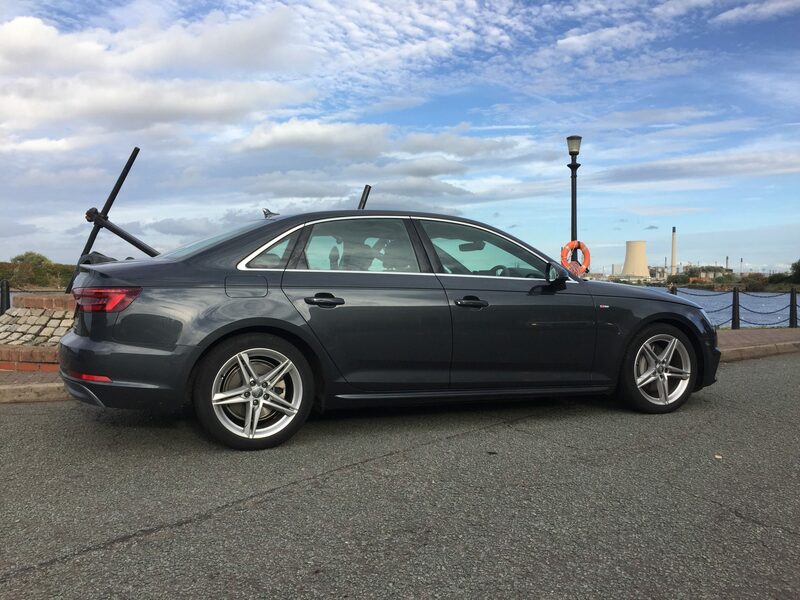 Audi A4 2.0 TDI ultra 190PS S tronic. I think I’ve found it. That is to say, I’ve finally driven a car that I prefer to a 3 Series BMW. The latest Audi A4 has left me happy in the knowledge that my quest after all these years is over. 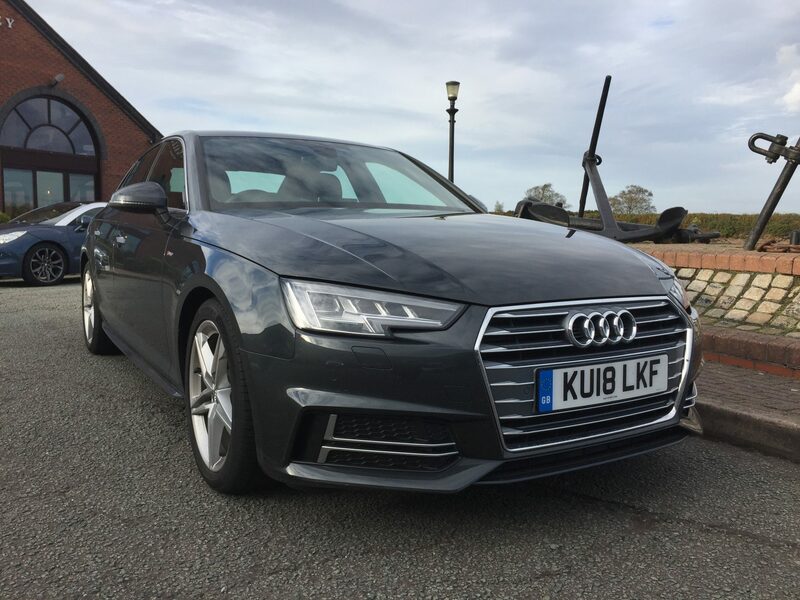 In all previous incarnations, the BMW was better, but after a week in the A4, which was a lovely place to be, the latest Audi A4 & particularly it’s cabin & technology really won me over. 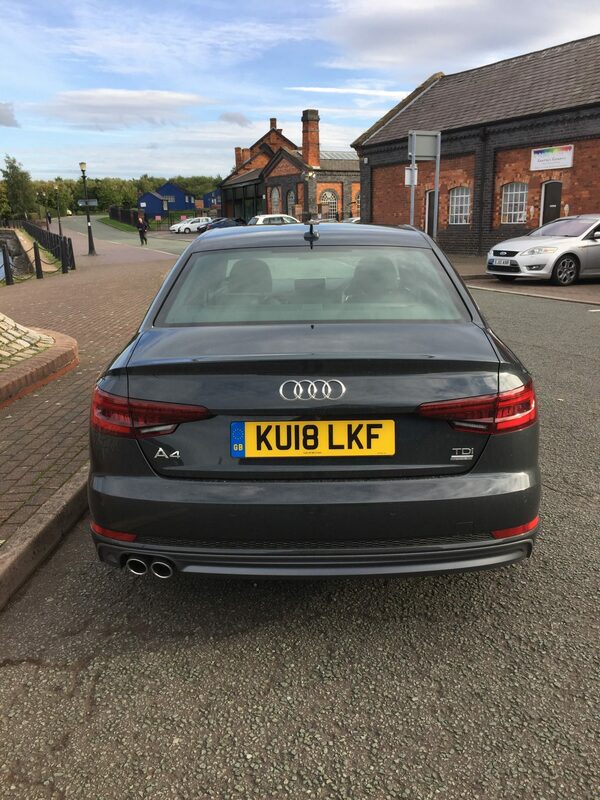 The current A4 uses the VW Group’s MLB Evo platform, which features engines that are mounted lengthways under the bonnet, rather than across the engine bay. This makes the A4 much lighter than the old car. With the engine mounted further back, the cars weight distribution is improved & the A4’s handling is better & it’s now almost as good as the 3 Series or Jaguar XE. We got to drive the 2.0litre TDI Ultra 190PS S tronic & mighty fine it was too. It sits at the top end of the range, but there are other models on offer. There are three petrol engines; 1.4, with 148bhp, 2.0 offering either 187bhp or 249bhp & the 3.0 a whopping 349bhp on the S4 model. At the very top of the range, the RS4 Avant has a 2.9 TFSI 450PS twin-turbo V6 that packs 444bhp.Diesel comes in the form of a 2.0 TDI & a 3.0 TDI. The 2.0-litre version comes in 150PS and 190PS guises with 148bhp and 187bhp respectively, the latter fitted to our test car. The 3.0 TDI is badged either 218PS or 272PS with 215bhp and 268bhp. A six-speed manual is standard on the 1.4 TFSI & the two lower powered 2.0 TDIs, while the seven-speed S tronic is available as an option. S tronic autos are standard for the most powerful 2.0 TFSI & lower powered 3.0 TDI, while the more powerful 3.0 TDI & S4 come with an eight-speed Tiptronic auto. Quattro four-wheel drive is found on selected models across the A4 range. It’s optional with the 2.0 TDI 190PS S tronic & is standard with the most powerful 2.0 TFSI, both 3.0 TDIs, the S4 & RS4. The A4’s exterior has been cleverly updated to aid fuel economy & reduce cabin noise. For example, the side mirrors have been mounted directly on the door panel rather than at its junction with the quarter light, which means more air can glide down the side of the car. Clever. The latest A4 is a bit longer than the previous model as well with new LED headlights & tail lights improving the look as well. Interior space in the Audi is excellent for the class, with plenty of room in both front & rear for four six footers. The boot offers a wide opening, coupled with a low floor, making access easy to the 480 litres on offer. If you fold down the rear seats the capacity increases to 995 litres, but of course, compared to a hatchback, the practicality is somewhat limited by the depth of the through space. Our test car came fitted with the S tronic auto box & we really enjoyed it. There’s a bit of a gruff edge to the auto box & it does tend to leap off from a standing start, especially in the wet, but once you get your right foot used to the accelerator pedal, it’s a blast. It’s both refined when required, around town for instance, with all the fun-of-the-fair arriving when you accelerate to join the motorway or overtake. We managed to put 300 miles on the millimetre in our week in the A4, with the usual combination of urban & motorway driving. Urban driving saw our fuel economy dip to unified 50mpg, whilst on the motorway we averaged 61.3 mpg, so quite a difference. Both are below Audis claimed figures for our teat model which were 57.6 mpg & 68.9 mpg. Pleasingly, even our 2.0 litre engine comes with low emissions of 107g/km. Inside, the A4’s pared down cabin in quality black & chrome is wonderful. Simple & aesthetically pleasing to the eye, I can see where Peugeot engineers spent most of their time when designing the cockpit of the latest 508. The interior is ” Truly Scrumptious, “ the nicest by far over it’s rivals. Everything fits together perfectly & its all made of top notch materials. Even the door pockets have been considered, with the plastic surround much thicker than any I’ve encountered before. The front passenger seats are comfortable, with an array of adjustment & right in front of the driver is the excellent 12.3″ Virtual Cockpit TFT display. This puts the cars infotainment & vehicle functions, including SatNav right in front of the driver. All of these can be accessed from the sports steering wheel in what I discovered to be the most straightforward way, compared to the systems found in a BMW, a Mercedes-Benz or a Volvo. t.
Getting into Bluetooth, Apple CarPlay, the DAB radio or even checking on your cars fuel economy & performance, can all be done through the steering wheel. There’s also a simple to use rotary wheel on the transmission tunnel, which also covers all of the bases too. Together, they make the A4’s connectivity one of the best in class. Our test car featured the Tech Pack, an additional £1400. This included a larger 8.3” dashboard mounted tablet screen & as we discovered, a really fast wireless charger, located under the centre armrest. I left my phone on this for 30 minutes from 5% & it jumped up to 78%, which is usefully quick. I’ve praised the A4, but are there any negatives ? The angular drivers wing mirror does emit some wind noise, you won’t get an adult to sit comfortably in the centre rear seat & our test car would set you back £36,695. Whilst we loved this particular model, for SME’s the range starts at £27,815 for the 6-speed manual 1.4 TSI 150PS petrol SE, whilst the 6-speed manual 150PS diesel SE, costs £31,045. Contract hire rates for this manual SE diesel start from £375 per month, 6 + 35 on a 10,000 miles per annum 3 year, non maintained contract. Four years has been a long time to wait to drive an A4. This latest A4 was a real surprise & proved to be much better than I had anticipated. I fell in love with the interior & the technology & also had high praise for the better ride & handling. The exterior is perhaps a little bland, but then so too is the outside of the BMW & Mercedes competition. And I have to say I like a wolf in a sheep clothing. Not many cars arrive at Company Car, then leave having left a smile on my face, but the A4 did just that. Definitely my new favourite premium saloon. A happy to report 4.25/5.